Now faith is the assurance that what we hope for will come about and the certainty that what we cannot see exists. Biblical faith is unique. Biblical faith makes a clear distinction between the Creator and the creature. Biblical faith is founded on the fact that God is God and we are not. Biblical faith is believing God’s Word and trusting God to keep His word. 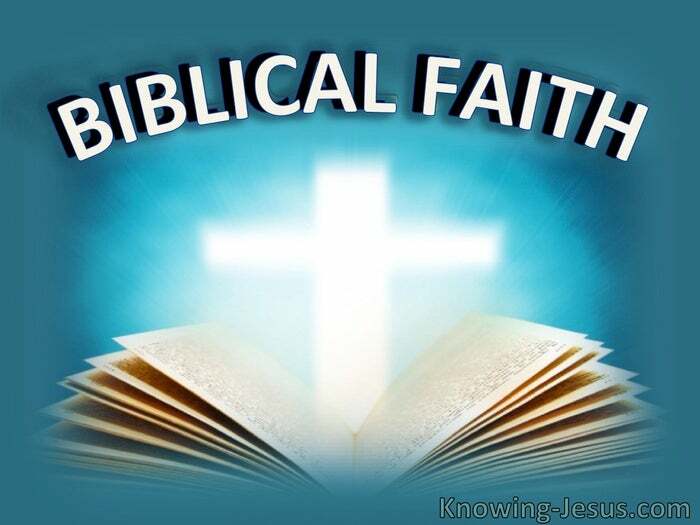 Faith is man’s response to the promises of God and God expects us to trust Him, but biblical faith can only be biblical faith if Jesus is central to our belief. God does not go out of His way to try to prove that He exists. He simply states it: in the beginning God created the heavens and the earth. Genesis 1:1 Either we exhibit faith and believe it or we reject it – there’s no middle ground. It is vital to believe in God, but His saving plan is only possible through Christ – so only those that believe in God, and Jesus Christ Whom He sent, are saved. God tells us the truth in His Word and He expects us to respond by believing Him. In the beginning was the Word – and the Word was God. John 1:1. We either trust His Word as true – or refuse to believe it. There’s no alternative. Faith is implemented through hearing the Word of God and God’s plan for man.. and faith is established by believing the Word of God and Christ’s finished work. 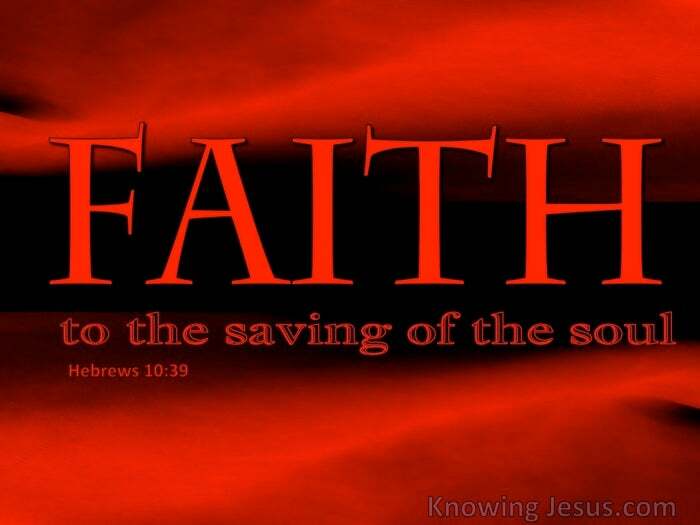 If we believe on Jesus as saviour then we are saved – period. Trusting in Jesus Christ as saviour is sufficient, for God seals you as His child, and at that point we enter an entirely new and exciting relationship with God. If we don’t believe on Jesus as saviour we are not saved and condemn ourselves. Only when we believe on Christ as saviour, does biblical faith really kick in. Salvation is the gifts of God’s grace to man and is accessed by believing His Word. Faith is not a ‘good work’ done for God, nor does faith have any merit or reward. Faith is a non-meritus response to the gospel of God. Faith has no room for human worthiness – but is based on Christ’s righteousness – it is not faith that merits salvation – but faith that gains access to God’s gift of grace. Faith is a free-will choice made by the individual, in response to the Word of God. Faith is the only possible response that God accepts – and salvation is the outcome.. but unbelief is also a free-will choice – and only condemnation follows unbelief. The issue in faith is not how much faith you have but in Whom you place your trust. Biblical faith is not an escape from reality or a retreat into some private little world. Biblical faith is not some airy-fairy fingers-crossed hope – or based on legalistic laws. Biblical faith is not a conditioning programme or a form or unthinking indoctrination. Biblical faith is not based on feelings and emotions or the false prosperity teachings. Biblical faith is not a political movement, a social club or a do-goody congregation. Biblical faith does not take the gospel and repackage into a feel-good programme. Biblical faith does not pretend to have extra biblical revelation or esoteric disclosures. Biblical faith has confidence in God’s character, His Word, His ability and promises. Biblical faith makes a clear distinction between the Creator and His creatures. Biblical faith is simply believing God’s Word and trusting God to keep His word. Biblical faith is unique. It is implemented through hearing the Word of God and God’s plan for man. It is established by believing the Word of God and Christ’s finished work.